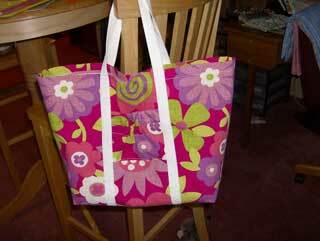 Here is a pattern that has easy-to-follow instructions for a great looking tote bag with pockets. This pattern offers different measurements from a tall bag to a shopping bag. The bag has a handle that runs the full length of the tote bag for a more secure hold. Pick out a print that fits your personality and make your own.